At the beginning of the year, Diet Coke introduced four new flavors. 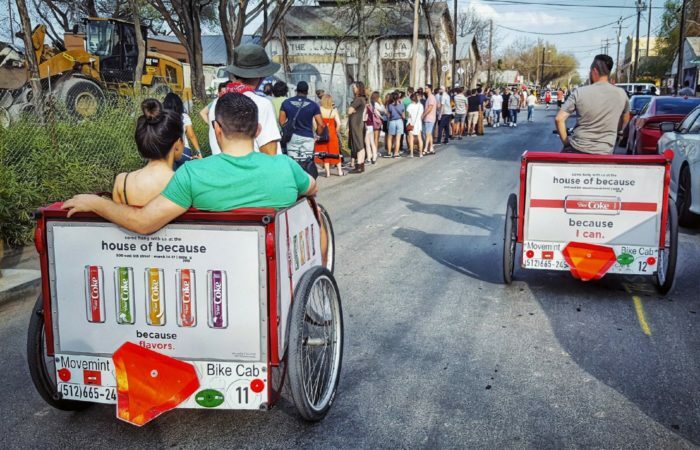 One month later, they held a one-day pedicab pop-up event in downtown Austin. It was pretty entertaining. For the pop-up, they wanted 10 fully-wrapped pedicabs, 10 pedicab operators, and for the operators to provide free rides for (you guessed it) four hours. Each operator was also provided Diet Cokes to pass out to passersby and patrons. The pedicabs themselves were wrapped with 3 distinct pieces of artwork. Each pedicab operator was provided long-sleeved shirts, mittens, and beanies. For the event, 5 of the pedicabs had their Diet Cokes kept cool in insulated cooler bags, and the other 5 pedicabs carried coolers that were strapped to their tailgates. It went well. It was a nice, cool day in Austin, with plenty of folks walking the streets. A major destination that evening was the Walk the Moon concert at ACL Live’s Moody Theater. * 10/10 Would do it again. We remained wrapped during SXSW 2018. We provided free rides again then, but we didn’t carry Diet Cokes, and we promoted their Diet Coke FTW! event at the House of Because. It was flattering when Diet Coke-affiliated folks praised our pedicabs; it makes us feel all warm and sunny inside. Fun fact, although I cannot find the photo right now to prove it: New York City mayor Bill de Blasio was in Austin for SXSW, and he was photographed riding in one of the Diet Coke pedicabs.